Students In Free Enterprise (SIFE) is an international non-profit organization that works with leaders in business and higher education to mobilize university students to make a difference in their communities while developing the skills to become socially responsible business leaders. Participating students form teams on their university campuses and apply business concepts to develop outreach projects that improve the quality of life and standard of living for people in need. An annual series of regional and national competitions provides a forum for teams to present the results of their projects, and to be evaluated by business leaders serving as judges. National champion teams advance to the prestigious SIFE World Cup. In addition to the community aspect of the program, SIFE’s leadership and career initiatives create opportunities for learning and exchange among the participants as well as the placement of students and alumni with companies in search of emerging talent. With passion we create social change and try building a better world. By using our cultural diversity to our advantage we learn, inspire, and teach both in our local community and internationally. Our mission is to bring together the top leaders of today and tomorrow to create a better, more sustainable world through the positive power of business. We have the man power (SIFErs) and the creativity but not the experience which we gain from our sponsors and the faculty advisors. We search for a good idea that full fill our three major criterions (social – economical – environmental) and then we do our research on those ideas till we a full plan that’s when we starts looking for new mentors to help us get our projects on their way forImplementation. Those mentors are our sponsors and faculty advisors. A community of students, academics, and business leaders committed to using the power of entrepreneurial action to transform lives and shape a better more sustainable world. Entrepreneurial: having the perspective to see an opportunity and the talent to create value from the opportunity. Action: the willingness to do something and the commitment to see it through even when the outcome is not guaranteed. Formerly known as SIFE O6U , We are a community of student, academic and business leaders committed to using the power of entrepreneurial action to transform lives and shape a better, more sustainable world. Guided by academic advisors and business experts, the student leaders of Enactus create and implement community empowerment projects around the globe.... The experience not only transforms lives, it helps students develop the kind of talent and perspective that are essential to leadership in an ever-more complicated and challenging world. entrepreneurial—having the perspective to see an opportunity and the talent to create value from that opportunity; action—the willingness to do something and the commitment to see it through even when the outcome is not guaranteed; usa collection of people who see themselves connected in some important way; individuals that are part of a greater whole. 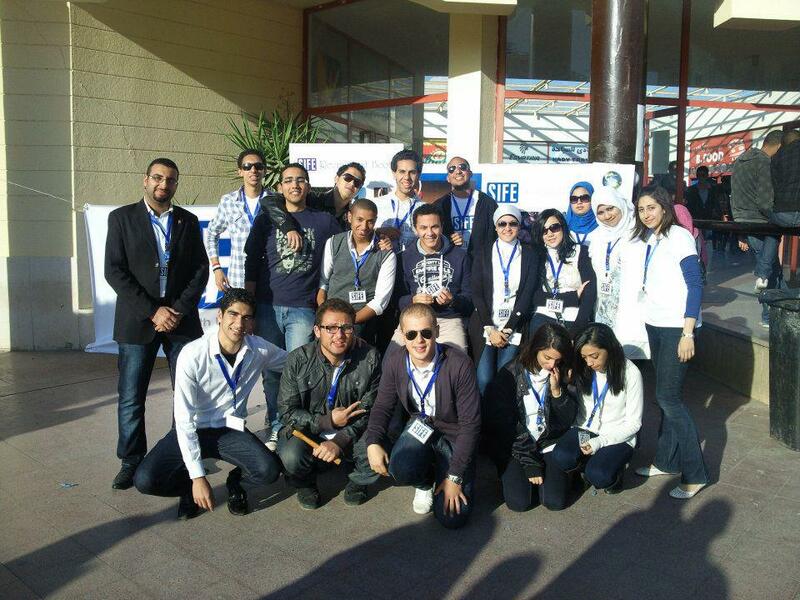 A one-day leadership training program took place at the AUC on December 1st 2013. Members of Enactus from 38 different Egyptian universities attended this event. First: Dr. Abdelkriim Sgheir-Dean of school of business -welcomed the audience and spoke words to spread the spirit of enthusiasm and positivity. Then: Dr. Andy wells-ExxonMobil’s representative-talked about the company’s role in supporting ENACTUS. After that: Dr. Heba Iskandar-Union Development Manger- talked about the institutional role in raising the standards of living for the Egyptian homes by introducing electric machines. And then: Mrs. Fatma Sery-president &CEO of ENACTUS Egypt- gave a brief summary about Enactus and a list of universities enrolled into Enactus. Judging Criteria was discussed by Dr. Reem Salama. For three weeks the Enactus O6U team held a recruiting event. students filled out the applications, forms were filtered and eligible applicants were contacted for an interview. After a week of interviews of 600 applicants, 151 new members were enrolled to the enactus o6u family. 1st G.O.T (General Orientation Training) with a soft opening in order to break the ice between the new members and the juniors (old members). The student president Mohamed Dawod made his opening remarks about enactus by explaining the mission, vision, objectives, and the Enactus judging criteria. Mohamed explained how Enactus has been able to help the community and change lives. Mohamed talked about last year’s projects and the national competition that Enactus O6U participated in. In addition, he spoke of the SADKO special mini-competition that we won first place for " An Environmentally Friendly Home Appliance".